When Egress, Inc. gets the go-ahead on your job, we produce an architectural drawing of your space showing the proposed window modification for city and county approval, as well as complete the necessary paperwork to pull the permit as the contractor of record. When required by cities or counties, or by a structural condition of your home, we arrange for a site visit by a licensed engineer and communicate the most cost-effective and safe way to modify the foundation of your home. Most of our jobs (not including excavation) are completed in a day, and your house is never open and exposed to the weather, except during the actual installation of the window itself. We usually excavate by hand — picks, shovels, wheel barrels, and lots of muscle. We protect your landscaping with tarps and remove all excess excess debris. We schedule the cutting and installation of your egress window(s) as soon after the excavation as possible. We protect your interior with carpet masks and drop cloths from the point where we enter your home, right up to the area where we are working. The foundation is typically cut from the outside. This process is wet and noisy, but not dusty. Most of the mess stays outside and the remainder is contained by our carpet and surface protection. The concrete is then pushed out, broken up, and loaded onto our trailer. The window well is set, backfilled, and properly graded to avoid water intrusion. 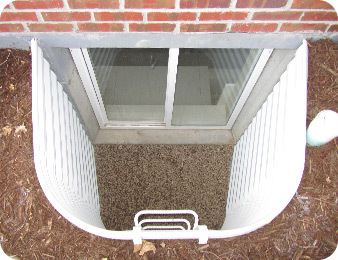 Click here for more information about window well options. We install your ladder, fresh gravel in the base of the well, then sweep, rake and place any remaining dirt on our trailers. We install your window, insulate it (if the room permits (delete red), seal it, trim it on the exterior with a maintenance-free vinyl or cement board. Often we will trim the interior, when contracted to do so, with paint or stain grade wood to match the existing wall. If you have ordered a cover, we can often install them on the same day. Upon completion of the job, an inspection by a city or county building official will be scheduled. We can arrange a day according to your schedule and will receive a window of time when the inspector will be there on that day. The inspection itself just takes a few minutes. No worries – inspectors love our work! What a great job; awesome guys; very impressed and happy with work. From the time they first met with Chad on, through Robert who lead the job, everyone in the company has been so helpful. We are very happy with the whole process."